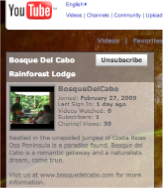 Bosque del Cabo has it's own YouTube Channel. Click here (or on image) to visit the Bosque del Cabo YouTube site or just view the videos directly by clicking on the video thumbnails you see here! Mrs. Macaw (aka Phil's mother Mary Ann Allison) takes us on a trip through the colorful history of Bosque del Cabo Rainforest Lodge. And you think the road is bad now...Enjoy!